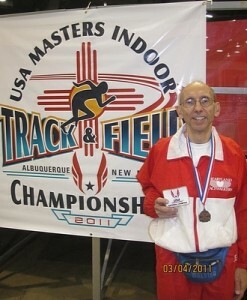 The USATF National Masters Indoor Track & Field Meet was held in Albuquerque March 4-6. A KC Track Club member, Alan Poisner won a Gold Medal in the 3000-meter walk in the 75-79 age division on a banked track in the convention center. His time (19:47) would have been good enough to take Silver Medals in the 65-69 and 70-74 divisions. The altitude (a bit over 5,000 feet) did not seem to bother him since he attained an 80.5% age-graded result but the low humidity caused everyone to suffer from very dry throats & some coughing. Way to go Alan!